This week with Twisted Sketches Twisted Cards we are using sketch #73 and doing something handmade. Well, I gotta admit, I wasn't sure what the rule meant by handmade. Soooo, when in doubt, I stamped and hand colored with my Watercolor Wonder Crayons from Stampin' Up! I hand pierced the upper edge of the pink cs. I added some stamped buttons and spruced them up with some Crystal Effects. I hope you like my Halloween card. I know it's early but it seems that as soon as school lets back in from summer vacation I start thinking of fall! 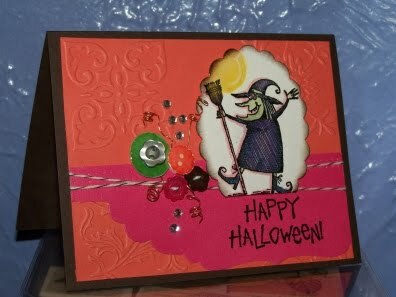 Oh I also entered this one in the Making Halloween Cards Challenge #8.